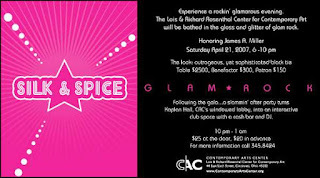 Hit the CAC Gala After Party April 21st at 10PM at the CAC (6th and Walnut Streets, Downtown, Cincinnati). The CAC’s Kaplan Hall lobby becomes a shock-rock club space with DJ Bill Redman and a cash bar. After Party reservations are $20 in advance at www.contemporaryartscenter.org; $25 at the door.